Wednesday, March 27, 2013. My boyfriend and I were on the wait list for L’Espalier‘s first 35th anniversary dinner in late January, but we didn’t manage to get off it. 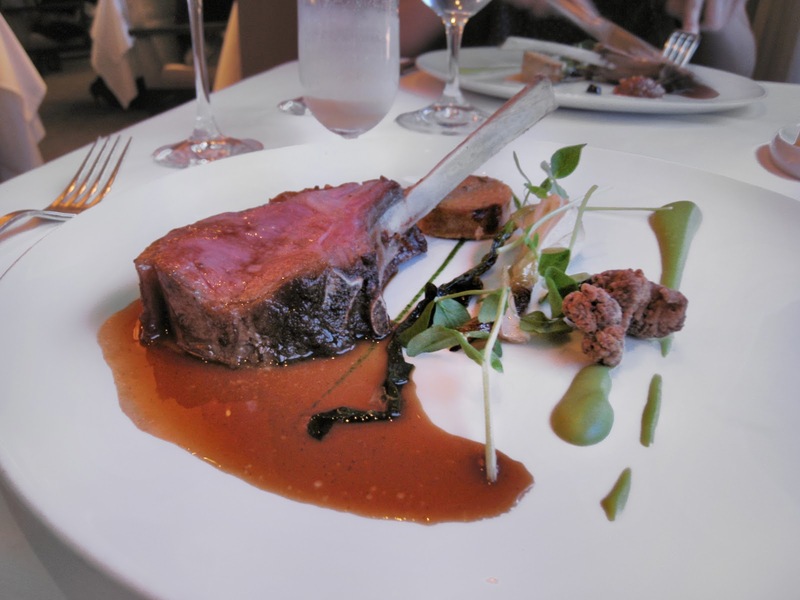 The dinner was relatively inexpensive for a L’Espalier meal at $48 per person, so it was very popular. Then in early March, I received a phone call from the restaurant. Their anniversary dinner had been such a success that they decided to hold a second dinner for everyone who had missed the first. Talk about customer service! My boyfriend had a previous obligation that evening, so naturally, I invited Jodie, my undeniably awesome dorm mate. Both transfer students, we had quickly bonded over food, student woes, and living in Northeastern’s most overpriced construction zone. (You think I’m exaggerating, but the day after our meal at L’Espalier, I saw rubble in another friend’s room. Construction workers had accidentally caved-in part of her ceiling.) This was our first chic dinner together. 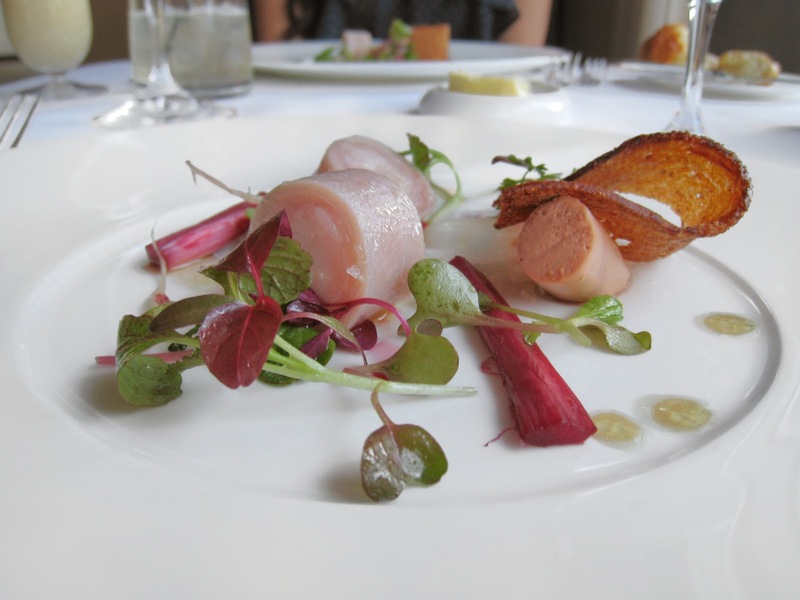 It was also my third visit to L’Espalier, and I was excited to return. Choosing just one “favorite” restaurant in Boston is difficult, but L’Espalier is definitely a contender. It was my first-ever tasting menu experience back in January 2011 and the site of my one-year anniversary dinner in December 2011. 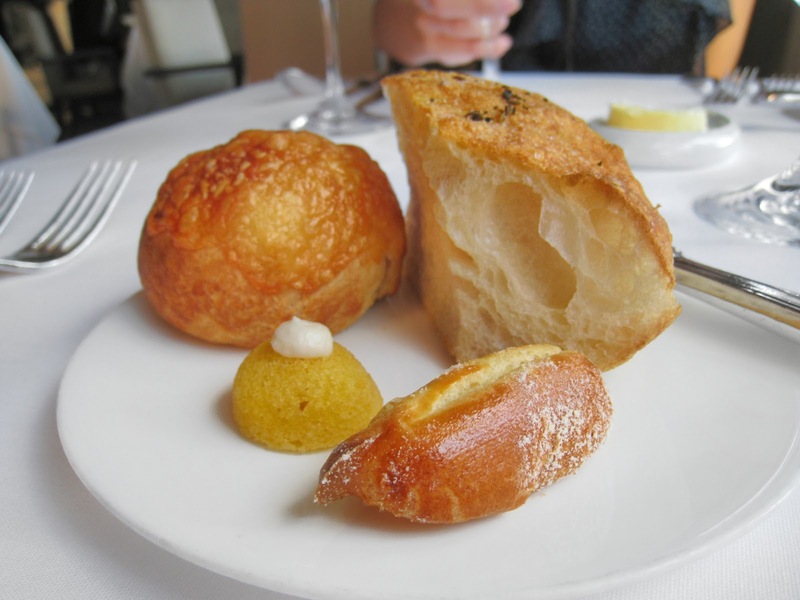 I’m sentimental about L’Espalier beyond its excellence as a restaurant. We walked from Northeastern for our six o’clock reservation, happy that the weather was warm even though it would still be several weeks before spring would arrive. We sat at the window and began by opting for non-alcoholic “juice pairings ($38 per person) with our meal. I’ve written about non-alcoholic pairings before: They’re creative; they’re cheaper than wine pairings; I can drink as much as I want without stumbling out of a nice restaurant; and most importantly, they’re legal for Jodie and me. Our amuse-bouches were a tiny éclair with mornay, and a spiced squash financier. Mornay is classic French béchamel sauce (butter, flour, and milk) plus grated cheese. The spiced squash financier was sweet and delicious. Back left: cheddar roll. Back right: rosemary foccacia. Front left: spiced squash financier. Front right: éclair with mornay. Each of the main courses had a specific decade as a theme. First course, 1970s: fresh shrimp in a Jonah crab bisque topped with asparagus, over a farro, sorrel, and almond salad drizzled with Apple Street Farm goat milk crème fraiche. I loved the crunchy, nutty farro salad and the silky-smooth bisque, but it’s hard to beat the simple flavor of fresh shrimp. This course was paired with a light ginger ale. 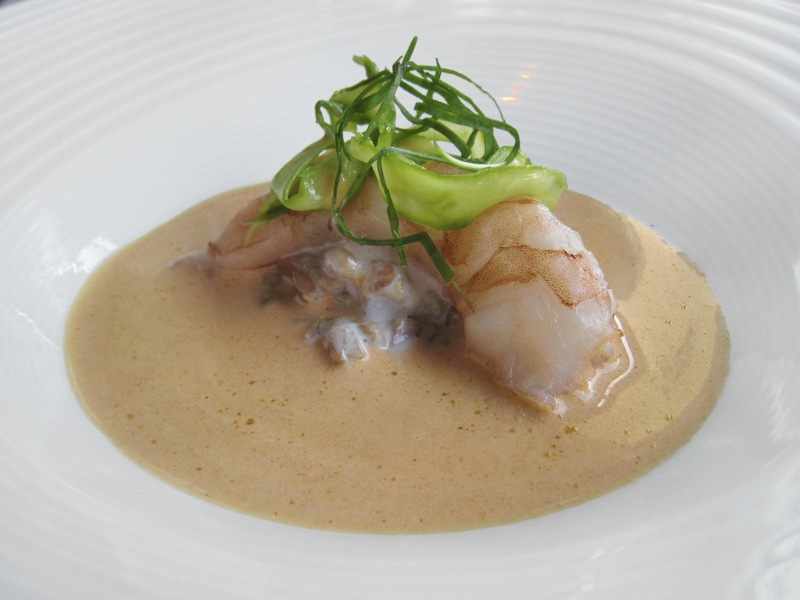 L’Espalier’s fresh shrimp in a Jonah crab bisque topped with asparagus, over a farro, sorrel, and almond salad drizzled with Apple Street Farm goat milk crème fraiche. Second course, 1980s: Vermont rabbit medallions scented with eau-de-vie Mirabelle and juniper, with foie gras mousse, rhubarb, and Apple Street Farm spring greens, finished with a few drops of maple water and sherry vinegar. L’Espalier’s Vermont rabbit medallions scented with eau-de-vie Mirabelle and juniper, with foie gras mousse, rhubarb, and Apple Street Farm spring greens, finished with a few drops of maple water and sherry vinegar. This was Jodie’s first time eating rabbit; and now that I think about it, my first time eating rabbit was during my first visit L’Espalier, too. The rabbit was moist and almost bouncy in texture but not rubbery. The rhubarb’s bright tanginess accented the rabbit’s delicacy. Jodie loved the foie gras so much that she ended up spreading it right onto her bread! The rabbit course was paired with a sweet, fruity kumquat colada that tasted a lot like an orange creamsicle. 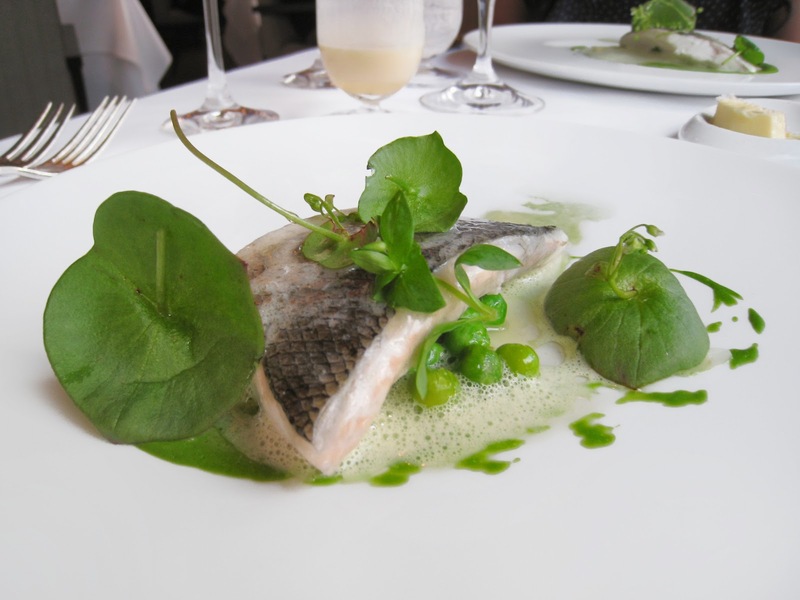 Third course, 1990s: Loup de mer (European seabass in English), oyster and spinach emulsion with compressed fennel, walnut oil and a plankton fumet. The fish was cooked to perfection. It flaked apart with gentle prodding, no knife necessary. The fennel added a sweet tang. This was a relatively simple whitefish dish and flavor palate, but simple is usually how I like my whitefish courses and this one was executed well. Indeed, this sea bass course tied for my favorite with our next lamb course. L’Espalier’s Loup de mer (European seabass in English), oyster and spinach emulsion with compressed fennel, walnut oil and a plankton fumet. Jodie commented that the entire menu had a definite spring feeling to it. I agreed, and hoped the weather would take the hint. The lychee lemonade paired with the white fish course goes down in history as one of my all-time favorite juice pairings. It begins delicate, develops into sweet, and then the tanginess of the lemon kicks in for a strong finish. As much as I enjoy trying new drinks, I sincerely hope that my next visit to L’Espalier includes a repeat of this lychee lemonade! Fourth course, 2000s: assiette of spring rack of lamb, with charred Vidalia onion, garlic sausage, and sweetbreads, finished with a fava-mint puree. L’Espalier’s assiette of spring rack of lamb, with charred Vidalia onion, garlic sausage, and sweetbreads, finished with a fava-mint puree. The lamb was tender and juicy and made me wonder why I don’t order lamb more often in restaurants (or move to Colorado). With the surprising spiciness of the sweetbreads and the sweetness of the Vidalia onions, this dish was a home run. Ditto for the rosemary-infused blood orange drink pairing. Of course, rosemary always sings with lamb. 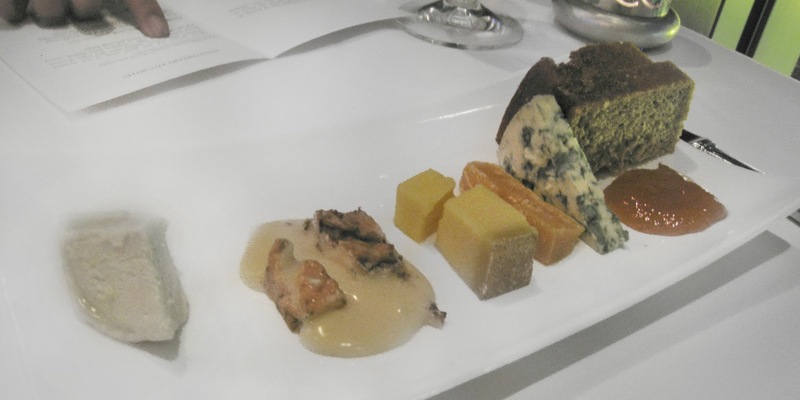 Fifth course, 2010s: cheese revolution. Having completed the first class of my Cheese Certificate course at Boston University almost one week prior, I was eagerly anticipating this and L’Espalier did n’t not disappoint. (1) Coupole, goat, from Vermont Butter and Cheese Creamery in Websterville, VT.
(2) Taleggio riserva, cow, from Lombardia, Italy. (3) Tarentaise, cow, from Spring Brook Farm in Reading, VT.
(4) Gouda, cow, from Holland. (5) Fourme d’Ambert, cow, AOC from Auverone, France. Unfortunately, the dimming light made for less-than-ideal photography conditions, but please believe me when I say that the cheese looked as good as it tasted. The Coupole goat cheese from Vermont Butter and Cheese Creamery was my favorite, but then, goat cheeses are usually my favorite. Jodie was partial to the taleggio riserva from Lombardia, Italy. The gouda from Holland was another favorite of ours, with a strong flavor and notes of caramel. Sixth course, “Into the Future”: rhubarb cream with rose croquant, honey micro cake and lemon-thyme frozen yogurt. The honey micro cake was sweet and soft and delicate. The rose croquant was a thin, brittle twisted layer of flavored caramelized sugar—”croquant” means “crunchy” in French—that vaguely resembled a piece of bacon, but tasted much better. I broke off a few pieces and let them melt on my tongue. This floral, spring-spirited dessert was excellent. 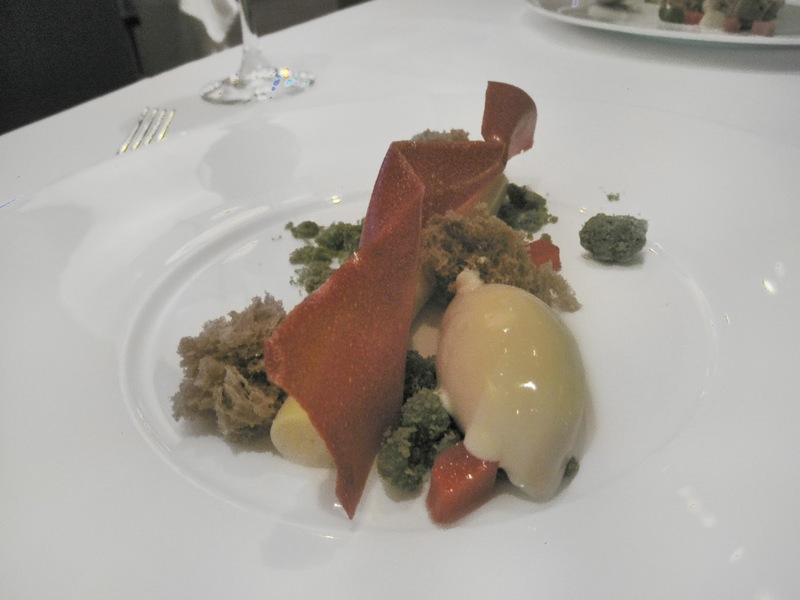 L’Espalier’s rhubarb cream with rose croquant, honey micro cake and lemon-thyme frozen yogurt. The waitstaff had our cheese menus signed by Louis Risoli, L’Espalier’s cheese expert, and our dinner menus signed by Frank McCelland, L’Espalier’s chef. I felt like a little kid holding a baseball cap that had just been signed by one of my favorite players. I think that’s how I looked, too. Afterward, we walked to the first floor of the Prudential Center to peek into L’Espalier’s kitchen as best we could without being total creepers. Like every classy L’Espalier patron, I took off my new not-yet-broken-in heels and walked through the Pru barefoot. Special thanks to Jodie for holding my shoes while I snapped photos of L’Espalier’s kitchen. 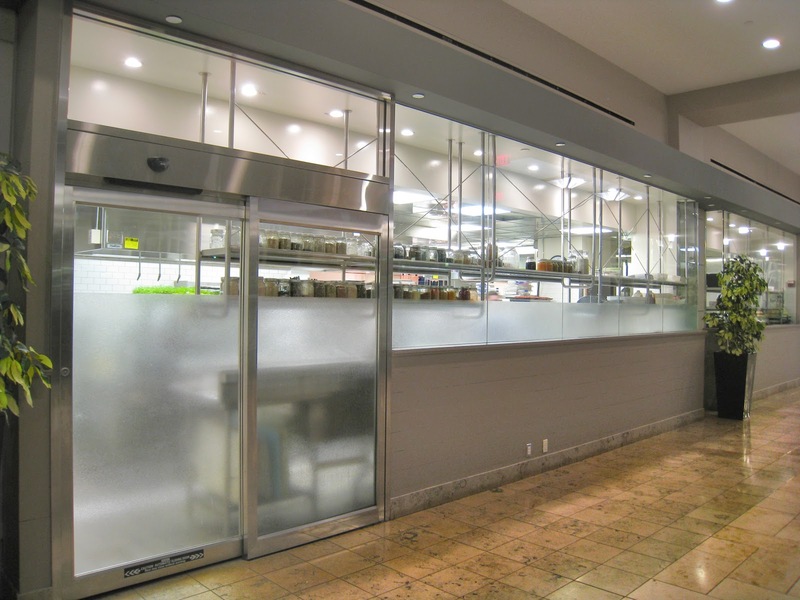 L’Espalier’s kitchen, as viewed from a hallway in the Prudential Center. L’Espalier’s second 35th anniversary dinner was phenomenal. Jodie and I had been swapping foodie stories since we first arrived on campus in September, hers from New York City and mine from Boston, and I had mentioned L’Espalier many times. Our meal was as amazing as the tales I’d told. I was thrilled to show my NYC friend the best fine dining that Boston has to offer. Thanks, L’Espalier!